After the recent "FMV Revival" brought on by the success of games such as HER STORY, THE BUNKER, and LATE SHIFT, we finally see the re-release of the most anticipated and infamous FMV game of all time. 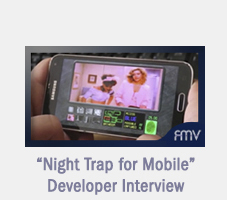 Last year, developer Tyler Hogle created a bootleg prototype of NIGHT TRAP for mobile devices. He ripped video files from an old Sega 32x CD of Night Trap and created a modern touchscreen experience for smartphones. Once word got out, he was contacted by the creators of Night Trap and commissioned to do an official release for Android and iOS. Interest for the project grew and soon the mobile-only game became a multi-platform release that included PC and console versions for both Playstation 4 and Xbox One. 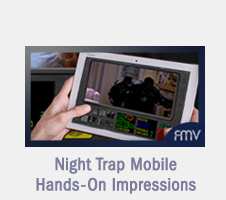 Can this modern version of Night Trap, made by a one-man development company, deliver? 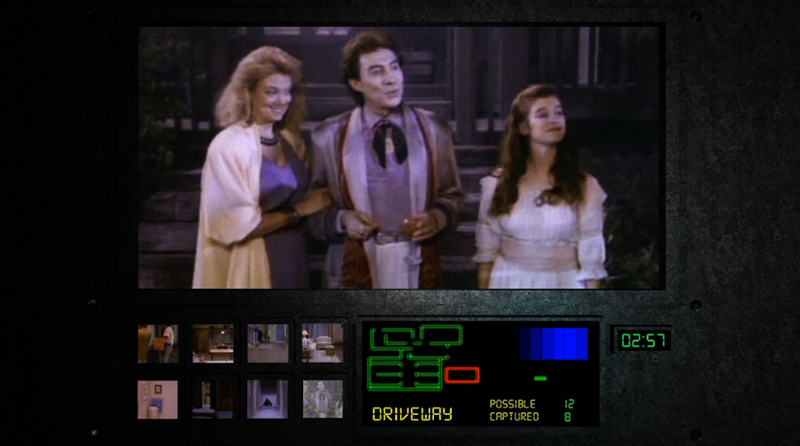 Movie scenes in Night Trap were always entertaining, but previous releases always suffered from poor resolutions and frame-rates. Thanks to the cooperation of Night Trap's original creative team, we now get master footage that's been restored to its original 4:3 ratio. This video upgrade allows you to see parts of the movie that were previously either too blurry or cropped out of frame. Furthermore, deleted scenes have been added directly into the game including a never-before-seen introduction that subtly changes the tone of the game. Although the new revelations in the intro leave less mystery to the proceedings than previous iterations, it provides insight into the horrors going on inside the Martin house. Screenshots above from Night Trap 25th Anniversary Edition. Click to enlarge. 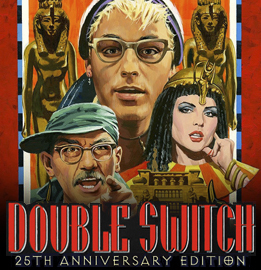 This is not a re-release; this is a remaster, a re-imagining, and a revitalization of the classic live-action movie game. 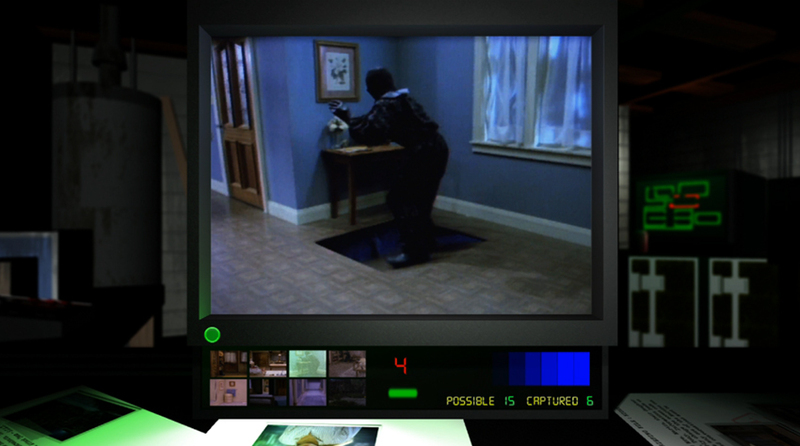 Night Trap now features an updated user interface that resembles a computer monitor equipped with a camera control panel. The static room icons of the original have been replaced with full-motion video thumbnails that reveal what's happening in every room simultaneously. This new feature not only makes the action and story in the house more cohesive, but it eliminates one of Night Trap's biggest problems; namely, searching aimlessly through empty rooms to find the action. Now the gameplay is more about focus and timing rather than an exercise in memorization or note-taking. It makes all the difference. In addition to the updated and streamlined gameplay, there are a slew of extras such as: retro layouts, theater mode, documentaries, production images, and a playable version of the never-before-seen Night Trap prototype Scene of the Crime. The addictive Survivor Mode removes the storyline entirely and let's you compete on global leaderboards to capture the most Augers. Survivor Mode's constant code-changes and deteriorating video-quality on the thumbnails add drama to the proceedings. It's an unexpected and brilliant addition to the Night Trap legacy and it ramps up the gameplay factor for those who say Night Trap isn't a "game." FINAL TAKE: Fans have waited years for Night Trap to hit modern consoles and not only has it delivered on the promises of high-quality video and improved gameplay, but the plethora of bonus features really surpasses anything we could have expected. 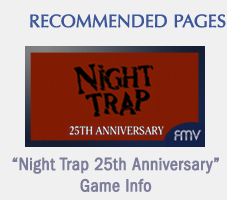 Night Trap 25th Anniversary Edition has been passionately reconstructed and polished to a shine that far surpasses any previous iterations. Screaming Villains has made the definitive version of this cult classic and, in doing so, has taken a good game and made it exceptional.